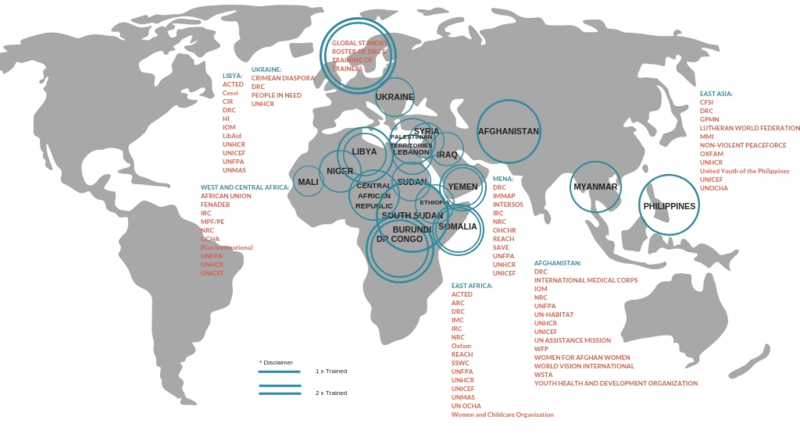 Since 2016, PIM trainings targeting humanitarian practitioners and protection coordination fora, have been delivered by the Danish Refugee Council (DRC), in partnership with the Global Protection Cluster (GPC) and the United Nations High Commissioner for Refugees (UNHCR), with funding from the European Commission’s Humanitarian Aid and Civil Protection (ECHO) Department. PIM training is a facilitated learning process to improve the ability of field protection coordination fora to develop more informed protection strategies, and to implement principled, systematized, and collaborative processes to collect, process, analyze, store, share, and use data and information to enable evidence-informed action for quality protection outcomes. PIM training participants, from a training in 2016. The PIM training is designed based on adult learning principles, and are dynamic, interactive and comprehensive. 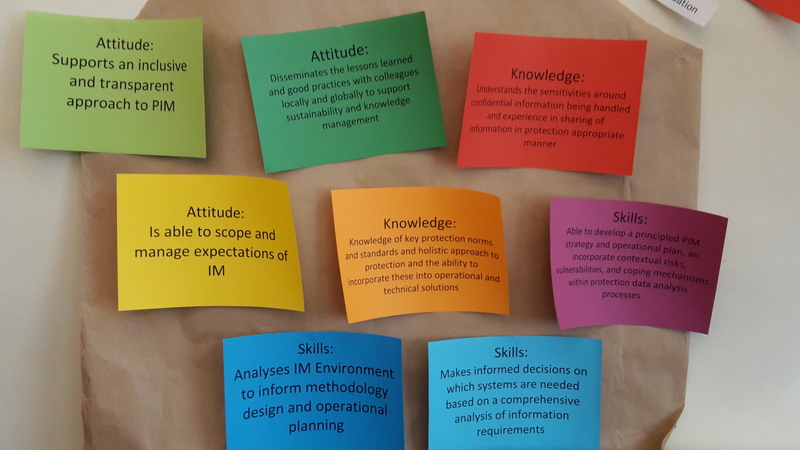 The training introduces participants to the PIM conceptual framework, inviting them to share their own experiences and present operational challenges around PIM collaboration. Through this process, participants acquire a PIM foundation for better communication and collaboration between protection and information management colleagues, by gaining and refining their existing attitude, skills and knowledge. 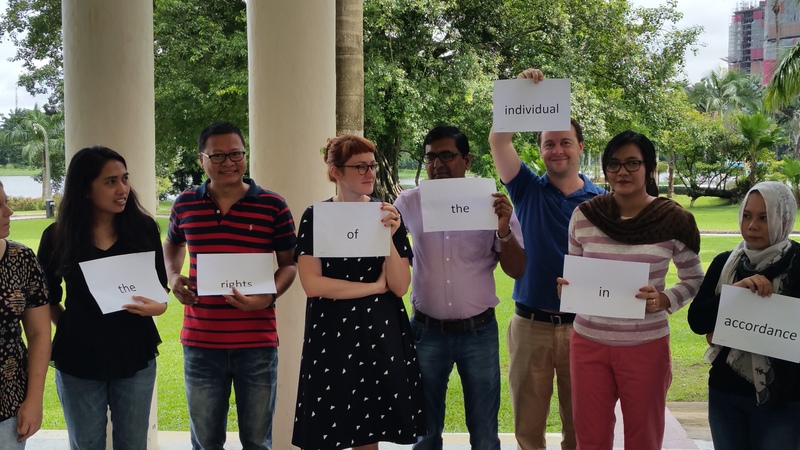 Though initially designed as 5-day training, the “PIM Training Resource Pack” can also be used to develop shorter learning events and workshops, including the possibility of integrating PIM learning into other trainings: contact PIM Training Team (pimtraining@drc.ngo) for more information. 56% of PIM Champions serve in protection functions, 39% in IM functions and 6% in other functions. 23% are leads or co-leads of a protection coordination forum. 100% of PIM Champions trained in 2017 -2018, reported that the PIM training equipped them with knowledge and skills to create a PIM-plan to inform protection analysis, strategy and response. 29 PIM Champions are trained as trainers – and have delivered independent PIM learning events and workshops to more than 150 in their regions or country operations. To learn more visit [https://www.youtube.com/watch?v=xTudhGjOipg]. The skills, attitude, and knowledge required to undertake PIM were shared with participants in all PIM trainings. Upcoming PIM trainings include a global PIM Training-of-Trainers (PIM ToT), which has the goal of expanding the pool of strategically positioned trainers who can offer PIM training as an extension of their existing areas of responsibility. If you are interested in learning more about PIM training opportunities, please contact DRC (pimtraining@drc.ngo). Interested in using the PIM Training Resource Pack? This PIM Training Resource Pack it is designed to enhance fundamental PIM competencies through five different training packages, and offers comprehensive and user-friendly instructions for how to plan and deliver learning events. Its purpose is to make PIM learning widely accessible to a global audience of humanitarian professionals and related stakeholders. It is available for use and incorporation into existing training programmes with due credit to the PIM Initiative. Please find the PIM Training Resource Pack here. 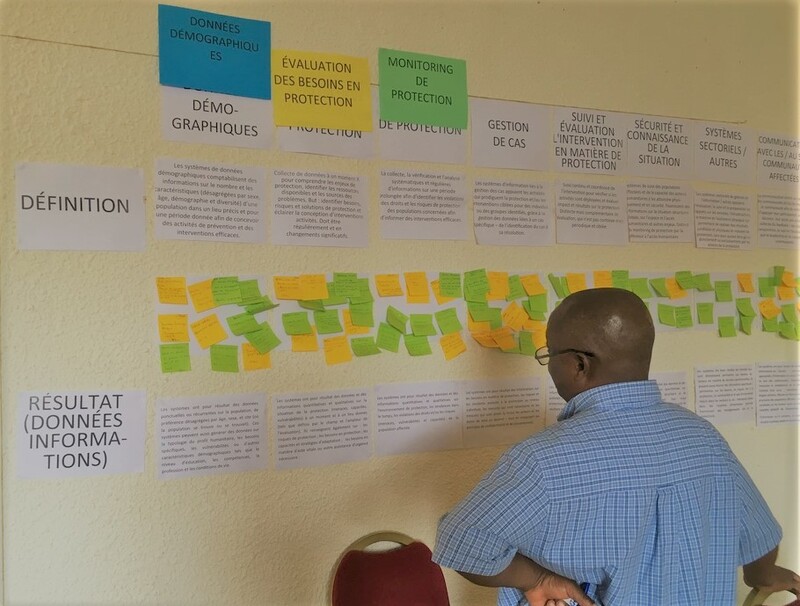 This course introduces PIM as a discipline, presents some of the key components of the PIM Conceptual Framework and explores its relevance for principled, systematised and collaborative work with data and information, for better protection outcomes for affected people in displacement situations. To learn more click here. Link up with others trained on PIM! Who has been trained, and where? Explore the map below to learn more (this map is being updated to reflect those trained in 2018 – stay tuned!). To find out if there is a PIM trainer in your area, please contact the PIM Training Team (pimtraining@drc.ngo) to learn more.